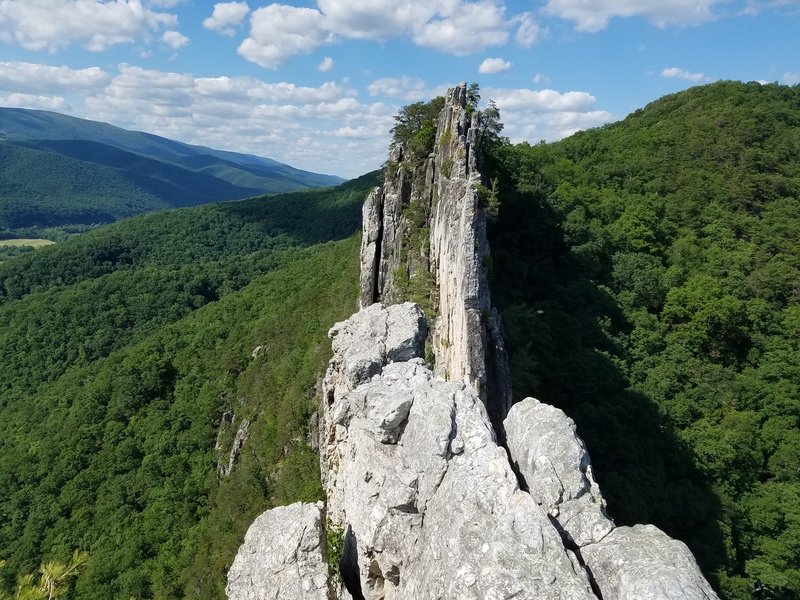 Looking along a ridge in Seneca Rocks, West Virginia. Photo: Will Fenwick. As I sit in my harness dangling below a massive roof, the sheath of my rope starts to fray as the cliff’s jagged edge of quartz begins sawing through to the core. My mind, entering fight-or-flight mode, convinces me death is imminent. Had I looked in the guidebook before coming up here, I would’ve known this route was famous for unfortunate epics. Back in the 1990s, a 22-year-old girl knocked a rock loose, severing the rope below her, resulting in a near-fatal fall. Half-a-day earlier that now feels like half-a-lifetime ago, my partner Will Fenwick and I left Baltimore at 4:00 am on three hours of sleep—probably one of the worst decisions of my life. The three hour drive to Seneca Rocks, West Virginia, was draining, with our bloodshot and dried eyes fighting to stay open on each winding turn of the road. Once we arrived, Will and I shook down our gear, trying to ignore the thought of each vertigo-inducing climb we would be faced with. Seneca is known for its sandbagged routes. Back during World War II, Army officers and enlisted men would train here as part of the Army’s low-altitude assault climbing school, before being sent off to go to war in Europe. Soon after they left the area, trad climbers swarmed in and began establishing routes. Simple J Malarky held our attention the moment we pulled into the parking lot. 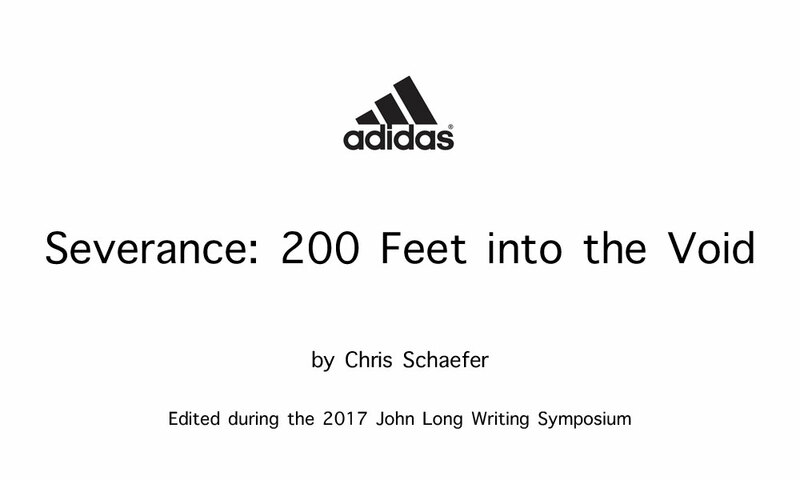 “It looks like a straightforward three-pitch classic, and the guidebook says it’s only 5.7. Let’s do it,” Will said. Will had started climbing a year before, but was already building an impressive tick list with Texas classics like Texas Crude (5.10b) and Port Side (5.11a). His engineering job had him hopping back and forth between Arkansas, Alaska, and Texas, allowing him to climb outside multiple times a month. Me, on the other hand, I hadn’t tied in to anything other than a gym rope in over five months… But we were here to climb and Simple J Malarky beckoned. Will took the sharp end and scrambled up the bald slab, crawling around a few blind corners. Before we knew it, we were at a fork in the road. “Let’s traverse a little more and finish on this roof crack called Muscle Beach. Guidebook says it’s a 5.8+,” said Will. As Will left to traverse around the bulging corner, I sat with my curiosity. Haven’t heard of too many roof cracks at 5.8 around here… This should be interesting. Will took as much time as it takes to watch a Game of Thrones episode, struggling with what I assumed was the crux of the pitch. “Off belay, Chris!” he yelled from around the corner. I broke down the belay and began climbing, cutting feet and removing gear with a precision that would make a German engineer blush. Then I saw it, in all it’s glory: the cavernous roof of Muscle Beach. Not bad… This roof is about 10 feet or so, Will only placed 2 pieces of gear… And it’s a 5.8. Psh… I got this.I took my time, looking for the best foot placements and beta as I entered the crux. Removing the first cam was a breeze, and I clipped it to the left side of my harness. All that’s left is a #3 stopper… Then I’ll shuffle the roof’s hand crack, pull the overhang, and crack one of our Dale’s Pale Ales that Will stashed in his backpack. I unclipped the nut tool from my harness, and went to town on it, taking jabs at it, hooking it, cursing at it. Chip chip… whack whack… nothing was working to get this stopper out of the wall. It wouldn’t budge. I switched hands when my arms began to sting. Sweat started pouring from my head, saturating my helmet liner. Will shouted from above,“Unclip the rope so it has slack, then you can take your weight off the gear and it should pop right out.” I did as he suggested, which sent me further away from the wall into the void. And so here I am—dangling with my tail between my legs, with 200 feet of air between me and the ground below. As I hang on my five year-old rope, it groans, turning bleached white as it stretches to its max trying to hold my body above the empty air and trees. Hanging in space, I’m only able to contact the rock with my fingertip to keep myself from spinning as the rope tries to untwist itself. My eyes widen with shock as I notice how the rope bends over the saw-toothed quartz. My mind flashes back to my friend Eric, who died while rope-soloing Moonlight Buttress (5.12d) in Zion National Park, likely from rapping off the end of his rope. He was without a doubt one of the best climbers I knew. His death reminds me rock climbing doesn’t discriminate. My options are bleak. Will can either lower me down 20 feet so I can climb up to the roof and fall again, increasing the risk of severing my rope, or I can just sit here with blood pooling in my legs from harness tension until a rescue arrives. I surrender myself to fate. As he rigs a system using his micro-traxion, I sit and question everything I’ve known about who I am: How easy is it to sell a used trad rack? Why did I stop sailing? Will I ever be able to climb after this? The self-doubt and shame become overwhelming. Will manually hauls my worthless body the remaining 15 feet to the finish. When I get there I say, “Will, I’m speechless and ashamed. I feel like dead weight.” Will admits he almost whipped on the roof a couple times himself. It takes only two minutes for Will to whip out his phone and double-check Mountain Project to see the variation finish we did was the end of Muscle Beach… 5.11a. I have no regrets about going up there. And I’m sure as hell not hanging up my trad rack. But even if you’re climbing a place you’ve been many times before, it’s never a bad idea to check the guidebook. 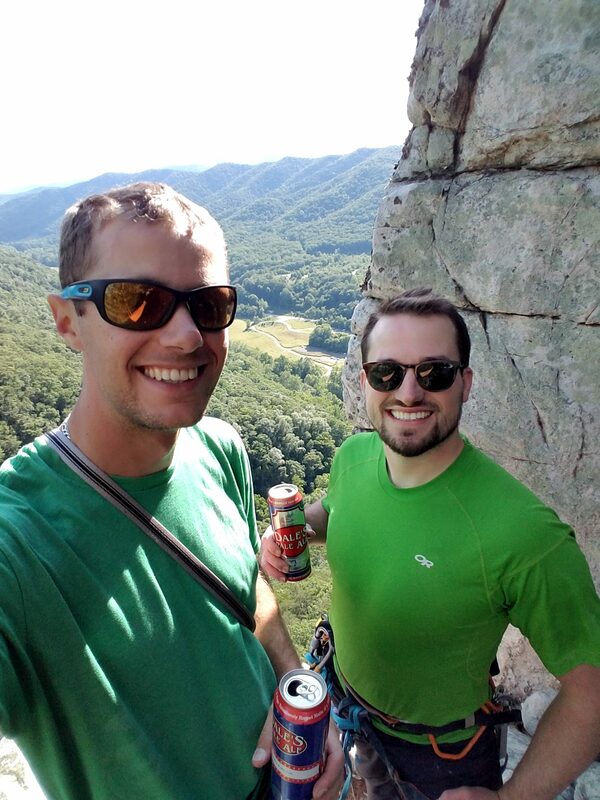 Will Fenwick (left) and the author nursing the celebratory Dale's Pale Ales after making it to the top. Photo: Will Fenwick. I agree .. after many trips to Seneca .. the climbs are definitely rated on the light side. It’s a steep and challenging crag with so many crack climbing opportunities. I particularly “like” the airy finishes of some climbs where you can see through to the other side .. yikes! As a new trad leader (crushed Old Man’s, lol) this story made me want to hang up the rack I haven’t yet purchased. Glad it all came right for you. I keep hearing stories of new ropes cut in two when climbers take falls-at Seneca. They are not increasing my confidence. Still. We all die, right?